Elemis has really caught my attention in the last year, as my Mum is a big fan, and Harvey Nichols tempted me with freebies to try, at their Leeds summer, Fashion show I couldn’t resist my first purchase. 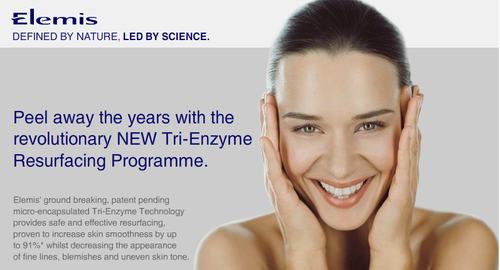 Elemis Tri Enzyme Resurfacing Facial Wash, £30.00. The Resurfacing Facial Wash is said to stimulate your skin’s natural cell renewal cycle, actively smoothing and refining whilst removing the dead skin cells that can dull your complexion. My skin at the time was very oily and congested. I had been reading reviews about how resurfacing enzymes and acid peels were great for Acne prone skin. Which is what seduced me away from my religious Liz Earle. I had so much hope for this product, thinking I had found the holy grail of fruity skin perfecter, but sadly I found the more I used it the more it fed angry acne breakouts. After this, It sat on my shelf for a good 6 months, but after having a break, I reintroduce it into my routine once/ every two weeks, which worked really well. It’s great for giving a really after wash clean feel and if I’ve abused lots of make-up on my skin all week, I like to have a deep cleanse with this before a shower but, I personally wouldn’t repurchase as there are lots of other great Elemis products that I would prefer for this resurfacing role. But of course it is personal skin types and I have seen numerous reviews that rave what results it gives. It smell absolutely amazing and straight after you use it you feel fresh and glowly. It seems to be the day after that mount Kilimanjaro and his friends appear for me. The cleanser I personally prefer from Elemis is the Pro-Collagen Cleansing balm. As its oily, It doesn’t give the same fresh cleaned face feeling that the Elemis resurfacing wash does, but I would prefer to use this and then finish with an acid/ exfoliator toner like Alpha-H Liquid gold.